Hawaiʻi Public Radio presents an evening of chamber music written especially for guitar, featuring award-winning classical guitarist Luke Trimble and an ensemble of chamber players from the Hawaiʻi Symphony Orchestra. The concert takes place on March 5 and closes the 2015-16 Atherton Winter Season. The Atherton Studio is noted for its unique suitability to the timbres of guitar and strings. The highlight of the program is Luigi Boccherini’s Quintet for Guitar & Strings No. 4 in D major. Other works include music for guitar and violin by Astor Piazzolla, Heitor Villa-Lobos, Terry Riley, and Niccoló Paganini, as well as new music for guitar and cello by Bryan Johanson. Tickets to this evening of guitar chamber music are $30 general, $25 for HPR members, and $15 for students with ID. Reservations may be made at www.hprtickets.org or by calling the station (955-8821) during regular business hours. The Atherton Studio is located at Hawaiʻi Public Radio, 738 Kāheka Street. Doors open at 7:00 p.m.; music begins at 7:30 p.m. He has performed in master classes with many of the world?s finest guitarists, including Thibault Cauvin, Michael Partington, James Reid, and Ana Vidovic. He was awarded First Prize, alongside fellow guitarists Mario Diaz and Jesse McCann, for their trio?s performance at the 2007 University of Texas Brownsville Ensemble Guitar Competition. 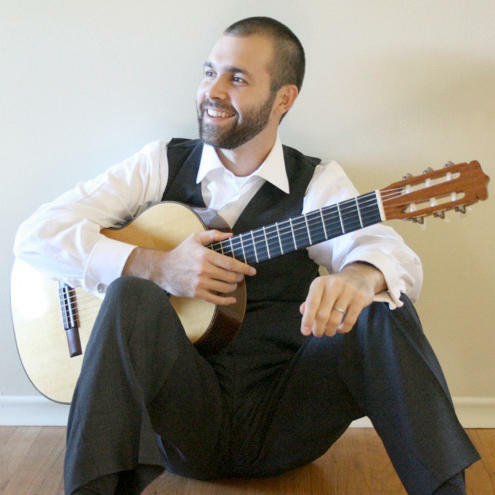 Trimble was also a semifinalist in the 2011 Portland International Solo Guitar Competition.